Prosoniq's Orange Vocoder offers perhaps the fastest, most flexible, and most transparent-sounding simulation of an analog vocoder effect. Following a long tradition of German vocoder effects, the Orange Vocoder is fully customizable and features an eight-voice virtual analog synthesizer unit, Freeform EQ, and Filterbank — all controllable from within one easy-to-use interface. And this RTAS plug-in is surprisingly efficient in terms of DSP usage, freeing up your system's resources to concentrate on more critical tasks. Real-time Vocoder effect for the RTAS platform. Uses either any input source/audio track or the built-in oscillator as carrier signal, and any audio track as modulator. 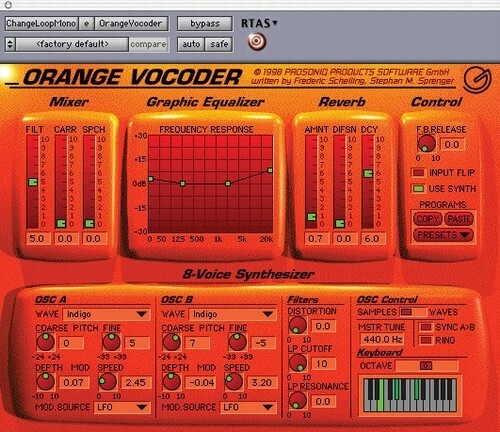 Orange Vocoder supports both RTAS sidechain routing and Pro Tools® automation. Integrated eight-voice virtual analog synthesizer with two oscillators per voice featuring 10 basic waveforms and seven sampled sounds, voice detune, pitch LFO, 4-pole Lowpass filter with cutoff and resonance, oscillator hard sync, and ring modulator. Fully customizable Freeform EQ with a maximum of 12 nodes, ranging from 20Hz to 20kHz and resolving from +30 to -30 dB FS. Input Channel flip to instantly exchange carrier and modulator signals without re-routing tracks. Post-Vocoder Filterbank Reverb Effect with Mix, Decay, and Density. Integrated preset program switch for easy parameter adjustment. Requires an iLok USB Smart Key for authorization (sold separately).